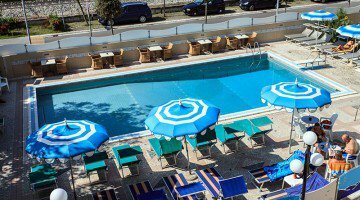 Hotel La Plaja is a 3 star hotel in San Mauro Mare with swimming pool, solarium, parking and free WI-FI throughout the entire hotel. Family-run, it accepts small pets that can also access the beah affiliated with the hotel thanks to the presence of a Fido Beach. This hotel adheres to the Green Booking project and has decided to donate a tree to the coast for a healthier environment and a more sustainable tourism. 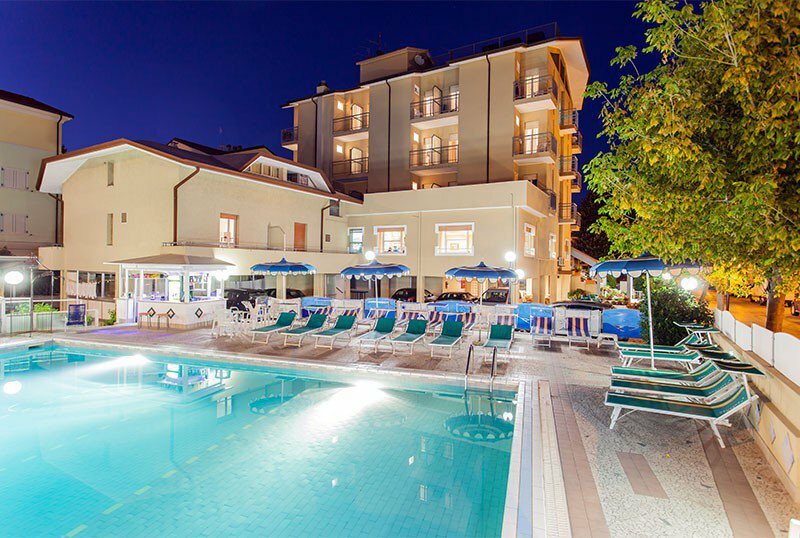 The hotel is located in San Mauro Mare in a quiet area. The beach can be reached on foot in less than 5 minutes. It has 37 Classic rooms all with a balcony except for the 8 rooms located on the ground floor. All rooms have satellite TV, telephone, safe, air conditioning, free WI-FI, bathroom with shower, hairdryer and complimentary toiletries. FAMILY: multi-bed rooms are available on request, ideal for families. Swimming pool with equipped sunbathing area, garden, free bicycles, 2 bars, one inside and one by the pool, reading room with newspapers, lift, luggage storage and late check out service, subject to availability. It is equipped for cyclists. PARKING: uncovered and free parking spaces, available to all customers; available covered parking spaces on request. PETS: small pets allowed, both at the hotel and at the beah affiliated with the hotel. BREAKFAST: buffet with croissants, bread, biscuits, yogurt, fruit juices and coffee drinks. LUNCH AND DINNER: 3 choice menu with vegetable buffet and dessert buffet. The dishes are typical of Romagna with fresh fish from the Adriatic, present every day, meat from the hinterland and homemade pasta. Water, soft drinks and house wine are unlimited and included with meals. In hotel: strollers, outdoor playground area, children's pool, live entertainment and pediatric advice on request for a fee. At meals: table seats, baby menus, broths, vegetable soups, small kitchen for mothers, baby food and bottle warmers. The hotel has a swimming pool with sunbathing area equipped with sun loungers and with the possibility of having a drink by the pool. The pool has a trampoline and a corner for children. At the affiliated establishment Grandi Spiagge, guests will find beach volleyball and beach tennis courts, a playground for children, entertainment for adults and children, nursery and swimming school. The establishment also has an area equipped for dogs with bowls, shower, fountain, brand and leash. TOURIST TAX: € 1.50 per day and applies for a maximum of 5 days (maximum € 7.50 per person). All minors are excluded from the payment. It is applied from June 15th to August 31st. - Single room: € 15.00 per day. 1st child FREE (up to 12 years) 2nd child -50% (up to 12 years) (if in a room with 2 adults - Min. 7 days) - To know all the All Inclusive family packages see the Special offer "June - Children Free - All Inclusive Family Packages - Hotel ***"
We are waiting for you at Easter with our full board formula at € 45 per person per day. If you are traveling with your family there are many discounts for children and family plans! 5 people in the same room pay 3.5 shares. Contact us to get your personalized offer and discover all the discounts and services dedicated to families! AUGUST: holidays &amp; entertainment in All Inclusive! Contact us and we will prepare for you the offer that best suits your needs!